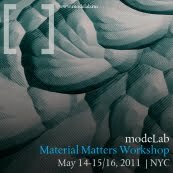 Join modeLab at their upcoming Material Matters workshop. The workshop is a two-day intensive design and prototyping workshop scheduled in Brooklyn, NY the weekend of May 14 and 15. An optional third day (May 16) may be added to your registration. Using Rhino and Grasshopper, participants will develop multiple instances of parametric prototypes to be represented in digital as well as fabricated output.